The gharial, scientific name Gavialis gangeticus are natives of indian subcontinent. 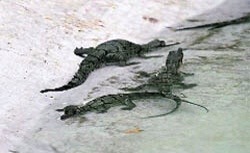 Since they mostly eat fish they are also known as fish eating crocodiles. As the scientific name indicates they are most commonly found in river Ganges. Like Ganges, they were also found in the rivers of North. But almost half a century ago, they vanished from Punjab’s rivers. There is a famous zoo near Chandigarh. It is called Mahendra Chaudhary Zoological Park. It is located at a place Chhat Bir. Bir in Punjab is the name given to a forest. There is in that zoological park, a pair laid eggs in captivity and newborns were hatched from 17 eggs. These were carefully looked after and have survived contrary to the earlier botched up attempts. These have crossed the fragile days when mortality rate is high and now getting ready to be sent into the river waters which is their natural habitat. Punjab wildlife department has taken a bold initiative to bring them back to their natural habitats in the month of February when the first batch will swim in the Beas and Satluj – two tributaries of the Indus river system. The project already has got the approval of Union ministry of environment and forests. First the department will educate the inhabitants living along these rivers about the habits of these animals. That they are harmless to humans and eat only fish. Gharials, which are also known as fish-eating crocodiles, fall in Schedule-I category of Wildlife Protection Act and are considered critically endangered species. According to district gazetteers of British period, there was a considerable population of gharials in these rivers. Gazetteers of the first decade of the last century have several references regarding their presence. But it was last seen in these rivers when the maharaja of Kapurthala had shot a gharial in 1968. Previous Previous post: Changes in Periodic Table of Chemicals…. Next Next post: Rudrakash Elaeocarpus blascoi: Last Tear of Siva?? ?